Davey Microlene Farm, making pure water a game changer for your farm. The solution delivers pure water for use on your farm, regardless of the source. Farmers currently using the solution have seen promising results in improved performance of livestock health, equipment maintenance and increased milk production. Watch this short 2 minute video below to see the Van Ras's early observations. The process of installing a Davey Microlene Farm system starts with a complete water test, which identifies the contaminants in your water supply to guide the design of the best system to improve the quality of your farm water. The Davey Microlene Farm unit is modular and is constructed with all the necessary components to improve the quality of your farm’s water. The unit also incorporates a HALO operating system with an option to add on the communications hub. The HALO hub provides continuous monitoring and control of the entire Davey Microlen Farm system, providing you with alerts to difficulties in the system allowing you to act on these before they become major problems. The HALO hub system may also be connected to other farm monitoring systems. Improved herd health by pathogen elimination. Improved production by optimising water quality. Improved animal health by increasing dosed mineral uptake. Reducing maintenance issues by removing hardness, iron and manganese from farm water. Meet farm compliance obligations by having a milking shed that meets high water quality standards and have all the information at hand to prove a complaint maintenance system is in place. Real-time cloud based controls direct to your mobile device or laptop giving you instant information, alerts and functionality 24/7. Future benefits* that may prove to be a game changer for your farm. *Davey are currently validating farm benefits through on-site testing in the Waikato region. 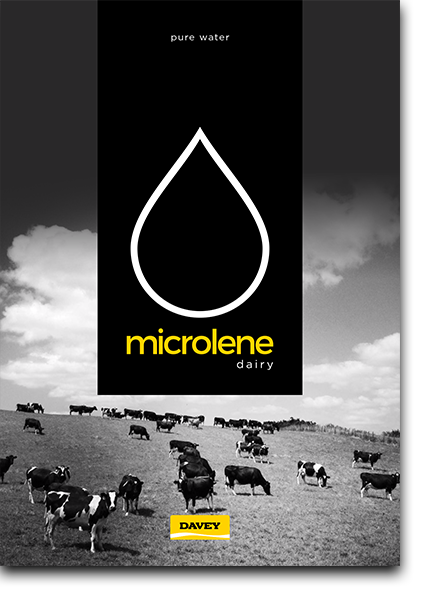 Download the Davey Microlene Farm brochure for more information.